here's a sneak peek of what i'm (very slowly) working on right now, an oversized cot quilt for a sweet little boy who is moving into his toddler bed soon. i'm almost done the quilt top, just need to find the perfect backing to get this one done - oh and some, time. yes, time would be nice. i was hoping to get this year's valentine oobees done but i am out of wool stuffing and really not up to making toys again yet after the huge binge in the weeks before christmas. so i guess my next shop update won't be for awhile, i'm thinking probably a couple of weeks before easter. and unfortunately, i can't take any more custom orders for the foreseeable future - i already have a waiting list for quilts that will take me to next christmas! plus i want to make a few things for the new baby - a girl!! did i mention we're having another girl?? yay! - and there are all those patterns i keep talking about writing... i need a clone, i think. maybe two. Congratulations on having another girl, how wonderful! Your quilt looks great and I dont know how you manage to do so much. I am sure you will achieve what you want with a little "slow time". Wouldnt it be nice if at the end of each day we could ask for a few extra hours! Firstly Leslie, congratulations, how exciting that Mae is going to be a big sister to a little sister. I have two sisters myself and it's a special, special thing! Two girls! Congratulations! I have two girls as well - lovely. I am a little biased, but I think two girls is lovely. 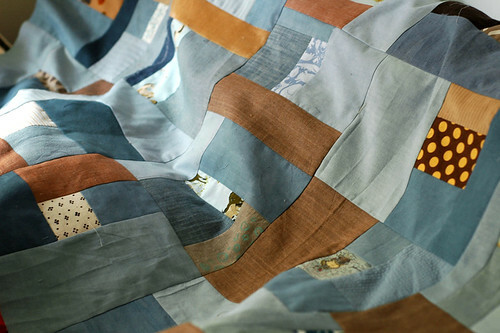 Love the colours in Leon's quilt. Stunning. Congratulations Leslie!! 2 little girls, how exciting. I am of course a little biased too! Yay!! It won't be that long now before they'll both be here. i love the simplicity of that quilt. with the pops of pattern. and super exciting that mae will have a sister. i love sisters. When you find out where to get clones will you pass on the details, I'll be first in the line! beautiful, beautiful quilt. I love it. a beautiful qulit for a boy.. This is gorgeous~I love it! First off, how nice that you are having another little girl! Is Mae getting excited to be a big sis? Secondly, the quilt is, as per usual, absolutely gorgeous! EXCELLENT stuff! Congrats on the girl news - sisters are fab (once you get over that pre-teen/teen dip when they are way daggy). That quilt is gorgeous. Once you think you have its measure, you spot another little surprise. oo, i can spot a square of marimekko fabric there! i saw one of your oobees on apartment therapy with the same print as a top (described as japanese on etsy) so i thought i'd let you know that it's a vintage finnish desing by maija isola for marimekko from 1969 called 'muija' (='broad' as in a woman). just thought you'd like to know, if you don't already. lovely quilt!